Not to be confused with Aconitase. Aconitine is an alkaloid toxin produced by the Aconitum plant, also known as devil’s helmet or monkshood. Monkshood is notorious for its toxic properties. In China, aconitine is also used in small doses as an analgesic and blood coagulant. Aconitine was previously used as an antipyretic and analgesic and still has some limited application in herbal medicine although the narrow therapeutic index makes calculating appropriate dosage difficult. Biologically active isolates from Aconitum and Delphinium plants are classified as norditerpenoid alkaloids, which are further subdivided based on the presence or absence of the C18 carbonaconitum. Aconitine is a C19-norditerpenoid, based on its presence of this C18 carbonaconitum. It is barely soluble in water, but very soluble in organic solvents such as chloroform or diethyl ether. Aconitine is also soluble in mixtures of alcohol and water if the concentration of alcohol is high enough. Like many other alkaloids, the basic nitrogen atom in one of the six-membered ring structure of aconitine can easily form salts and ions, giving it affinity for both polar and lipophilic structures (such as cell membranes and receptors) and making it possible for the molecule to pass the blood-brain barrier. The acetoxyl group at the c8 position can readily be replaced by a methoxy group, by heating aconitine in methanol, to produce a 8-deacetyl-8-O-methyl derivatives. If aconitine is heated in its dry state, it undergoes a pyrolysis to form pyroaconitine ((1α,3α,6α,14α,16β)-20-Ethyl-3,13-dihydroxy-1,6,16-trimethoxy-4-(methoxymethyl)-15-oxoaconitan-14-yl benzoate) with the chemical formula C32H43NO9. Aconitine can interact with the voltage-dependent sodium-ion channels, which are proteins in the cell membranes of excitable tissues, such as cardiac and skeletal muscles and neurons. These proteins are highly selective for sodium ions. They open very fast to depolarize the cell membrane potential, causing the upstroke of an action potential. Normally, the sodium channels close very rapidly, but the depolarization of the membrane potential causes the opening (activation) of potassium channels and potassium efflux, which results in repolarization of the membrane potential. Aconitine binds to the receptor at the neurotoxin binding site 2 on the alpha-subunit of the channel protein. This binding results in a sodium-ion channel that stays open longer. Aconitine suppresses the conformational change in the sodium-ion channel from the active state to the inactive state. The membrane stays depolarized due to the constant sodium influx (which is 10-1000 fold greater than the potassium efflux). As a result, the membrane cannot be repolarized. The binding of aconitine to the channel also leads to the channel to change conformation from the inactive state to the active state at a more negative voltage. In neurons, aconitine increases the permeability of the membrane for sodium ions, resulting in a huge sodium influx in the axon terminal. As a result, the membrane depolarizes rapidly. Due to the strong depolarization, the permeability of the membrane for potassium ions increases fast, resulting in a potassium reflux to release the positive charge out of the cell. Not only the permeability for potassium ions but also the permeability for calcium ions increases as a result of the depolarization of the membrane. A calcium influx takes place. The increase of the calcium concentration in the cell stimulates the release of the neurotransmitter acetylcholine into the synaptic cleft. Acetylcholine binds to acetylcholine receptors at the postsynaptic membrane to open the sodium-channels there, generating a new action potential. Research with mouse nerve-hemidiaphragm muscle preparation indicate that at low concentrations (<0.1 µM) aconitine increases the electrically evoked acetylcholine release causing an induced muscle tension. Action potentials are generated more often at this concentration. At higher concentration (0.3–3 µM) aconitine decreases the electrically evoked acetylcholine release, resulting in a decrease in muscle tension. At high concentration (0.3–3 µM), the sodium-ion channels are constantly activated, transmission of action potentials is suppressed, leading to non-excitable target cells or paralysis. Aconitine is naturally synthesized by the monkshood plant via the terpenoid biosynthesis pathway (MEP chloroplast pathway). 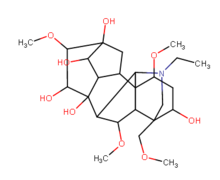 Approximately 700 naturally occurring C19-diterpenoid alkaloids have been isolated and identified, but the biosynthesis of only a few of these alkaloids are well understood. Likewise, only a few alkaloids of the aconitine family have been synthesized in the laboratory. In particular, despite over one hundred years having elapsed since its isolation, aconitine represents a rare example of a well-known natural product that has yet to succumb to efforts towards its total synthesis. The challenge that aconitine poses to synthetic organic chemists is due to both the intricate interlocking hexacyclic ring system that make up its core and the elaborate collection of oxygenated functional groups at its periphery. Some simpler members of this family of natural products, however, have been prepared synthetically. In 1971, the Weisner group discovered the total synthesis of talatisamine (a C19-norditerpenoid). In the subsequent years, they also discovered the total syntheses of other C19-norditerpenoids, such as chasmanine, and 13-deoxydelphonine. The total synthesis of napelline (Scheme a) begins with aldehyde 100. In a 7 step process, the A-ring of napelline is formed (104). It takes another 10 steps to form the lactone ring in the pentacyclic structure of napelline (106). An additional 9 steps creates the enone-aldehyde 107. Heating in methanol with potassium hydroxide causes an aldol condensation to close the sixth and final ring in napelline (14). Oxidation then gives rise to diketone 108 which was converted to (±)-napelline (14) in 10 steps. A similar process is demonstrated in Wiesner’s synthesis of 13-desoxydelphinone (Scheme c). The first step of this synthesis is the generation of a conjugated dienone 112 from 111 in 4 steps. This is followed by the addition of a benzyl vinyl ether to produce 113. In 11 steps, this compound is converted to ketal 114. The addition of heat, DMSO and o-xylene rearranges this ketol (115), and after 5 more steps (±)-13-desoxydelphinone (15) is formed. Lastly, talatisamine (Scheme d) is synthesized from diene 116 and nitrile 117. The first step is to form tricycle 118 in 16 steps. After another 6 steps, this compound is converted to enone 120. Subsequently, this allene is added to produce photoadduct 121. This adduct group is cleaved and rearrangement gives rise to the compound 122. In 7 steps, this compound forms 123, which is then rearranged, in a similar manner to compound 114, to form the aconitine-like skeleton in 124. A racemic relay synthesis is completed to produce talatisamine (13). More recently, the laboratory of the late David Y. Gin completed the total syntheses of the acontine alkaloids nominine and neofinaconitine. Aconine: an amorphous, bitter, non-poisonous alkaloid, derived from the decomposition of aconitine. Aconitine is metabolized by cytochrome P450 isozymes (CYPs). There has been research in 2011 in China to investigate in-depth the CYPs involved in aconitine metabolism in human liver microsomes. It has been estimated that more than 90 percent of currently available human drug metabolism can be attributed to eight main enzymes (CYP 1A2, 2C9, 2C8, 2C19, 2D6, 2E1, 3A4, 3A5). The researchers used recombinants of these eight different CYPs and incubated it with aconitine. To initiate the metabolism pathway the presence of NADPH was needed. Selective inhibitors were used to determine the involved CYPs in the aconitine metabolism. The results indicate that aconitine was mainly metabolized by CYP3A4, 3A5 and 2D6. CYP2C8 and 2C9 had a minor role to the aconitine metabolism, whereas CYP1A2, 2E1 and 2C19 did not produce any aconitine metabolites at all. The proposed metabolic pathways of aconitine in human liver microsomes and the CYPs involved to it are summarized in the table above. The toxic effects of aconitine have been tested in a variety of animals, including mammals (dog, cat, guinea pig, mouse, rat and rabbit), frogs and pigeons. Depending on the route of exposure, the observed toxic effects were: local anesthetic effect, diarrhea, convulsions, arrhythmias or death. Others: dizziness, hyperventilation, sweating, difficulty breathing, confusion, headache, and lacrimation. Progression of symptoms: the first symptoms of aconitine poisoning appear approximately 20 minutes to 2 hours after oral intake and include paraesthesia, sweating and nausea. This leads to severe vomiting, colicky diarrhea, intense pain and then paralysis of the skeletal muscles. Following the onset of life-threatening arrhythmia, including ventricular tachycardia and ventricular fibrillation, death finally occurs as a result of respiratory paralysis or cardiac arrest. LD50 values for mice are 1 mg/kg orally, 0.100 mg/kg intravenously, 0.270 mg/kg intraperitoneally and 0.270 mg/kg subcutaneously. The lowest published lethal dose (LDLo) for mice is 1 mg/kg orally and 0.100 mg/kg intraperitoneally. The lowest published toxic dose (TDLo) for mice is 0.0549 mg/kg subcutaneously. LD50 value for rats is 0.064 mg/kg intraveneously. The LDLo for rats is 0.040 mg/kg intravenously and 0.250 mg/kg intraperitoneally. The TDLo for rats is 0.040 mg/kg parenterally. For an overview of more test animal results (LD50, LDLo and TDLo) see the following table. For humans the lowest published oral lethal dose of 28 μg/kg was reported in 1969. For the analysis of the Aconitum alkaloids in biological specimens such as blood, serum and urine, several GC-MS methods have been described. These employ a variety of extraction procedures followed by derivatisation to their trimethylsilyl derivatives. New sensitive HPLC-MS methods have been developed as well, usually preceded by SPE purification of the sample. The antiarrhythmic drug lidocaine has been reported to be an effective treatment of aconitine poisoning of a patient. Considering the fact that aconitine acts as an agonist of the sodium channel receptor, antiarrhythmic agents which block the sodium channel (Vaughan-Williams’ classification I) might be the first choice for the therapy of aconitine induced arrhythmias. Animal experiments have shown that the mortality of aconitine is lowered by tetrodotoxin. The toxic effects of aconitine were attenuated by tetrodotoxin, probably due to their mutual antagonistic effect on excitable membranes. Also paeoniflorin seems to have a detoxifying effect on the acute toxicity of aconitine in test animals. This may result from alternations of pharmacokinetic behavior of aconitine in the animals due to the pharmacokinetic interaction between aconitine and paeoniflorin. In addition, in emergencies, one can wash the stomach using either tannic acid or powdered charcoal. Heart stimulants such as strong coffee or caffeine may also help until professional help is available. During the Indian Rebellion of 1857, a British detachment were the subject of attempted poisoning with aconitine by the Indian regimental chefs. The plot was thwarted by John Nicholson who, having detected the plot, interrupted the British officers just as they were about to consume the poisoned meal. The chefs refused to taste their own preparation, whereupon it was force fed to a monkey who “expired on the spot”. The chefs were hanged. Aconitine was the poison used by George Henry Lamson in 1881 to murder his brother-in-law in order to secure an inheritance. Lamson had learned about aconitine as a medical student from professor Robert Christison, who had taught that it was undetectable—but forensic science had improved since Lamson’s student days. In 1953 aconitine was used by a Soviet biochemist and poison developer, Grigory Mairanovsky, in experiments with prisoners in the secret NKVD laboratory in Moscow. He admitted killing around 10 people using the poison. In 2004 Canadian actor Andre Noble died from aconitine poisoning. He accidentally ate some monkshood while he was on a hike with his aunt in Newfoundland. In 2009 Lakhvir Singh of Feltham, west London, used aconitine to poison the food of her ex-lover Lakhvinder Cheema (who died as a result of the poisoning) and his current fiancée Aunkar Singh. Singh received a life sentence of 23 years for the murder on February 10, 2010. Lurida terribiles miscent aconita novercae. Aconitine was also made famous by its use in Oscar Wilde‘s 1891 story “Lord Arthur Savile’s Crime“. Aconite also plays a prominent role in James Joyce’s Ulysses, in which the protagonist Leopold Bloom’s father used pastilles of the chemical to commit suicide. Aconitine poisoning plays a key role in the murder mystery “Breakdown” by Jonathan Kellerman (2016). ^ “Yunnan Baiyao finally discloses toxic ingredient”. GoKunming. 2014-04-07. ^ a b Chan TY (April 2009). “Aconite poisoning”. Clinical Toxicology. 47 (4): 279–85. doi:10.1080/15563650902904407. PMID 19514874. ^ Biogenetically, aconitine is not a ‘true’ alkaloid, as it is not ultimately derived from amino acids. Aconitine is ultimately derived from isoprene, so it is technically a terpenoid and a pseudoalkaloid. ^ Shi Y, Wilmot JT, Nordstrøm LU, Tan DS, Gin DY (September 2013). “Total synthesis, relay synthesis, and structural confirmation of the C18-norditerpenoid alkaloid neofinaconitine”. Journal of the American Chemical Society. 135 (38): 14313–20. doi:10.1021/ja4064958. PMC 3883312. PMID 24040959. ^ “Aconitine”. Sigma Aldrich. Retrieved 22 July 2016. ^ “Aconitine sc-202441 Material Safety Data Sheet” (pdf). Santa Cruz Biotechnology. ^ Dewick PM (2002). Medicinal Natural Products. A Biosynthetic Approach (2nd ed.). Wiley. ISBN 978-0-471-49640-3. ^ Desai HK, Joshi BS, Ross SA, Pelletier SW (1989). “Methanolysis of the C-8 Acetoxyl Group in Aconitine-Type Alkaloids: A Partial Synthesis of Hokbusine A”. Journal of Natural Products. 52 (4): 720–725. doi:10.1021/np50064a009. ^ Pelletier SW, Mody NV (1979). “Chapter 1 The Structure and Synthesis of C19-Diterpenoid Alkaloids”. In Manske RH, Rodrigo R. The Alkaloids: Chemistry and Physiology. 17. p. 4. doi:10.1016/S1876-0813(08)60296-1. ISBN 9780080865416. ^ “Pyroaconitine ChemSpider ID: 10211301”. Chemspider. ^ Gutser UT, Friese J, Heubach JF, Matthiesen T, Selve N, Wilffert B, Gleitz J (January 1998). “Mode of antinociceptive and toxic action of alkaloids of Aconitum spec”. Naunyn-Schmiedeberg’s Archives of Pharmacology. 357 (1): 39–48. doi:10.1007/pl00005136. PMID 9459571. ^ Benoit E (1998). “[Mechanism of action of neurotoxins acting on the inactivation of voltage-gated sodium channels]”. Comptes Rendus des Séances de la Société de Biologie et de Ses Filiales (in French). 192 (3): 409–36. PMID 9759381. ^ Okazaki M, Kimura I, Kimura M (December 1994). “Aconitine-induced increase and decrease of acetylcholine release in the mouse phrenic nerve-hemidiaphragm muscle preparation” (pdf). Japanese Journal of Pharmacology. 66 (4): 421–6. doi:10.1254/jjp.66.421. PMID 7723217. ^ Viberti F, Raveggi E. “Aconitine: How Poisonous, How Harmful?”. flipper e nuvola. Retrieved 26 April 2017. ^ Zhao PJ, Gao S, Fan LM, Nie JL, He HP, Zeng Y, Shen YM, Hao XJ (April 2009). 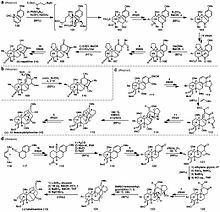 “Approach to the biosynthesis of atisine-type diterpenoid alkaloids”. Journal of Natural Products. 72 (4): 645–9. doi:10.1021/np800657j. PMID 19275222. ^ a b Wiesner K, Tsai TY, Huber K, Bolton SE, Vlahov R (July 1974). “Total synthesis of talatisamine, a delphinine type alkaloid”. Journal of the American Chemical Society. 96 (15): 4990–4992. doi:10.1021/ja00822a048. ^ a b Wiesner K, Tsai TY, Nambiar KP (15 May 1978). “A new stereospecific total synthesis of chasmanine and 13-desoxydelphonine”. Canadian Journal of Chemistry. 56 (10): 1451–1454. doi:10.1139/v78-237. ^ a b Wiesner K (1 January 1979). “Total synthesis of delphinine-type alkaloids by simple, fourth generation methods”. Pure and Applied Chemistry. 51 (4): 689–703. doi:10.1351/pac197951040689. ^ Peese KM, Gin DY (July 2006). “Efficient synthetic access to the hetisine C20-diterpenoid alkaloids. A concise synthesis of nominine via oxidoisoquinolinium-1,3-dipolar and dienamine-Diels-Alder cycloadditions”. Journal of the American Chemical Society. 128 (27): 8734–5. doi:10.1021/ja0625430. PMC 2610465. PMID 16819859. ^ Tang L, Ye L, Lv C, Zheng Z, Gong Y, Liu Z (April 2011). “Involvement of CYP3A4/5 and CYP2D6 in the metabolism of aconitine using human liver microsomes and recombinant CYP450 enzymes”. Toxicology Letters. 202 (1): 47–54. doi:10.1016/j.toxlet.2011.01.019. PMID 21277363. ^ Bertilsson L, Lou YQ, Du YL, Liu Y, Kuang TY, Liao XM, Wang KY, Reviriego J, Iselius L, Sjöqvist F (April 1992). “Pronounced differences between native Chinese and Swedish populations in the polymorphic hydroxylations of debrisoquin and S-mephenytoin”. Clinical Pharmacology and Therapeutics. 51 (4): 388–97. doi:10.1038/clpt.1992.38. PMID 1345344. ^ a b “RTECS”. Oct 2011. ^ a b Beike J, Frommherz L, Wood M, Brinkmann B, Köhler H (October 2004). “Determination of aconitine in body fluids by LC-MS-MS”. International Journal of Legal Medicine. 118 (5): 289–93. doi:10.1007/s00414-004-0463-2. PMID 15674996. ^ Tsukada K, Akizuki S, Matsuoka Y, Irimajiri S (October 1992). “[A case of aconitine poisoning accompanied by bidirectional ventricular tachycardia treated with lidocaine]”. Kokyu to Junkan. Respiration & Circulation (in Japanese). 40 (10): 1003–6. PMID 1439251. ^ Ohno Y, Chiba S, Uchigasaki S, Uchima E, Nagamori H, Mizugaki M, Ohyama Y, Kimura K, Suzuki Y (June 1992). “The influence of tetrodotoxin on the toxic effects of aconitine in vivo” (pdf). The Tohoku Journal of Experimental Medicine. 167 (2): 155–8. doi:10.1620/tjem.167.155. PMID 1475787. ^ Fan YF, Xie Y, Liu L, Ho HM, Wong YF, Liu ZQ, Zhou H (June 2012). “Paeoniflorin reduced acute toxicity of aconitine in rats is associated with the pharmacokinetic alteration of aconitine”. Journal of Ethnopharmacology. 141 (2): 701–8. doi:10.1016/j.jep.2011.09.005. PMID 21930193. ^ Irving SN (1979). Dangerous Properties of Industrial Materials (Fifth ed.). New York: Van Nostrand Reinhold Company Inc. ISBN 978-0-442-27373-6. LCCN 78-20812. ^ Macinnis P (2006). It’s True! You Eat Poison Every Day. Allen & Unwin. pp. 80–81. ISBN 9781741146264. ^ Macinnis P (2005). Poisons: From Hemlock to Botox and the Killer Bean of Calabar. Arcade Publishing. pp. 25–26. ISBN 978-1-55970-761-9. ^ Parry LA, Wright WH (2000). Some Famous Medical Trials. Beard Books. p. 103. ISBN 978-1-58798-031-2. ^ Лаборатория Икс [Laboratory X]. Novaya Gazeta (in Russian). 2010-05-06. Archived from the original on 2010-05-30. Retrieved 2013-04-08. ^ “Poisoning in west London in 2009”. BBC TV News. 2010-02-10.